Not every guardian angel has wings. In the Gutter, we take our cues where we find 'em. The hardest part, really, was choosing the right sock. Daryl Jones had them all lined up in a row on his bed. To his left, a fresh white sock, straight out of the package. He looked at it for a moment, shook his head, and threw it in the hamper. It was too new. Too white. Mama Jones had been white, of course, but she’d never been new or fresh, even when she was younger. Daryl remembered the dry, cracked skin of her face, forever flaking with psoriasis; the fine black line of the mustache which hung above her upper lip; the sweat that perpetually lined her forehead; the sockets of flesh in which her eyes were buried; that was Mama Jones. But Daryl also remembered the way Mama Jones looked inside her coffin, which was slightly different than the memory of her from his childhood. He’d stood over her the day of the wake for what seemed like hours, looking into her freshly made-up face. The mortician had added color to her pale cheeks and lipstick to her rubbery lips, which Daryl had found grotesque. But beneath the grotesquerie, he could still make out the grim lines of her mouth, and he remembered the way those lines would become horribly sharp whenever he found himself in trouble—“lecturin’ time” is what Mama Jones had called it. Mama Jones had been fond of her lectures, and even as she lay there in death, the evidence of a life-time of them showed beneath the makeup. So he couldn’t choose the fresh white sock because the images wouldn’t reconcile. The next was a dress sock, black. It also went into the hamper. As did the blue and green socks. He spent the next several minutes doing this. Puzzling over socks, looking at them carefully, slowly reducing the number of them on his bed. Once the number reached two, Daryl paused. There was one white sock, old and frayed, with elastic popping out in places. Beside it was a gray gym sock which still retained some vestiges of sweat around the heel and toes. In the end, Daryl threw the white sock into the hamper and chose the gray. The dark, faded stains reminded him of the bags beneath Mama Jones’ eyes. He pulled the sock over his left hand and fastened it in place with a rubber band. He took a large black marker and drew in two eyes, a nose and a mouth. He tried to make the mouth look the way he remembered it. Tight, sharp, and cold. As he only had a marker and a sock, Daryl was actually quite pleased with the result once he’d finished up. Stretching his hand out in front of him, the face looked almost uncannily like Mama Jones. Albeit in sock form, of course. Daryl Jones went into his kitchen. On top of the refrigerator were two cartons of Marlboro’s. He grabbed them with his right hand and walked over to the trash can. He pressed the can’s lever with his foot and prepared to throw the cigarettes inside, but realized that he couldn’t; he had, instead, opened the carton and was in the process of sliding a cigarette out of the pack and into his mouth. “Watcha doing, Daryl? Watcha doing, boy?” Mama Jones asked. He looked down at the sock. Mama Jones stared back at him. He looked the other way and saw the pack of cigarettes in his right hand. “Aw, I was just gonna have one or two, mama. That’s all,” Daryl said. So Daryl put the cigarettes into the trash can. He walked back over to the fridge, this time opening the door. Inside, lined neatly on each shelf, were a multitude of crisp cold cans. There was a bottle here and there, but most of that had already been drunk. All that was left was the beer. He took one out and popped the top, raising the can to his lips. So Daryl dumped the beers down the sink. All of them. All forty-some-odd cans. He threw the empties into the same trash can as he had the cigarettes, pulled out the bag, and tied it shut. Mama Jones slapped him across the face. Hard. Daryl felt his lips smash back against his teeth, and when he looked down at the sock, he saw a smear of blood on Mama Jones’ mouth. It reminded him of the lipstick at the wake. So Daryl walked back into his bedroom—if you could call the space where his soiled mattress rested on the floor a bedroom—and lifted the mattress off the floor. Beneath it, in a hollowed out section of floor board, was a large brown box. Inside this box was a virtual Molotov cocktail of uppers, downers, cocaine, amphetamines, and LSD. So Daryl threw the box and all of its contents into the trash bag—which he had reopened—and took the heavy white sack out to the curb. He stood for a moment in the daylight, blinking his eyes, trying to see the world the way someone else might see it. A world bereft of shadow, devoid of darkness, free of things with long legs and black, staring eyes. But he couldn’t. He saw those things. Creepy things, shrouded by a perpetual night the sunshine couldn’t touch. Scrabbling over the buildings all around him. As there was nothing else to do, Daryl lay down in his bed and pulled the ratty blanket up tight to his chin. “Daryl? Is that you? I didn’t expect to see you again,” said Mr. Murphy. He had a large black garbage bag in one hand, and he was using the other to empty out a locker marked with a piece of white tape with the name JONES printed on it in heavy black ink. Mr. Murphy looked at Daryl with a hesitant, questioning eye. Daryl didn’t look too good. “Yeah, I can see that, Mr. Murphy. And I’s really sorry about all the trouble I been causing you,” Daryl said, scratching at his face, his neck. His eyes were bloodshot and his fingers were trembling. Mr. Murphy didn’t know if Daryl was any better at all. He didn’t think it likely. But the guy looked so pathetic standing there, with his clothes hanging wrinkled on his skinny body, his eyes as red as a ferret’s, Mr. Murphy figured, what the hell? He’d have Daryl clean up the abandoned offices on the 47th and 50th floors. That should take a while, and no one would be around if Daryl started acting up again. So Mr. Murphy gave Daryl’s things back to him, showed him to the janitor’s closet and directed him to the 47th floor. As Mr. Murphy turned to leave, he glanced back at Daryl, who was bent over the rolling cart, and called out to him. As Daryl did not own a vehicle, he walked the three miles between the subsidized apartment in which he lived and Mr. Murphy’s building almost every day (the exception being on rainy days, when he took the bus). Along this path, which took Daryl through various neighborhoods and commercial areas, was a narrow alleyway wedged between a Chinese food restaurant and a liquor store. The alley was perpetually dark, even in the daylight, and just inside this alley was a large green dumpster. Standing next to this dumpster, on most days, was a man named Cookie Palmer. Cookie stood next to the dumpster religiously, always wearing the same pseudo-uniform: a ripped and soiled t-shirt with the faded image of Elmo in the center, and a pair of baggy sweatpants in equal states of disrepair. The sweatpants had two big pockets, and on any given day, they might be filled with cocaine or heroin or MDMA or whatever else Cookie could stuff inside a flimsy plastic bag and tie with a string. Cookie knew Daryl well. So when he saw the shape of Daryl’s head come around the corner of the liquor store, he smiled; Daryl was a good customer. But then Cookie’s smile faltered. Daryl seemed to be having a conversation with his hand, a hand that was, apparently, covered with a sock. A moment later, Daryl left the alley without saying a word to Cookie. Cookie was confused for a moment, but then he shrugged and took a hit from the yellowing pipe that he’d shoved down the front of his sweatpants. “I gotta say, Daryl, you’ve surprised me,” Mr. Murphy said. “In a good way, sir?” asked Daryl, who was sitting opposite Mr. Murphy at a large wooden desk. Mr. Murphy’s office was on the 60th floor, and the view was spectacular. But he never took his eyes off Daryl. So Daryl went home and stood in front of the garbage can where this whole rehabilitation process got started. He looked down at his hand. Mama Jones didn’t look too good. Her face was moldy and lined with dirt. The blood stain that looked so much like lipstick was still there, but it had faded to a dark maroon color. It was the face of Mama Jones as it had been six months after her casket had been lowered into the ground. Daryl reached for her. “Whatcha doing, boy? Whatcha doing?” Mama Jones asked. “Mama, I have to,” Daryl said, anger creeping into his voice. Same old mama. Never content to let him be. Daryl reached again for the sock but it came up and smacked him in the face. He pushed it away with his other hand and wrestled it down to the floor. Mama Jones shrieked, her high-pitched cackling wale sending needles into Daryl’s brain. The anger, like something released from a cavernous dam, flooded through him. He placed a knee below Mama Jones’ throat and used his other hand to grab the rubber band. But she wiggled free. She came up and punched him squarely in the nose, breaking it, causing a red wave to cascade down the front of his face. Daryl uttered a scream, danced back, and delivered his own punch to Mama Jones’ face. He heard his ring finger snap. “You’s got to go away, mama,” Daryl shouted. “Whatcha doing, boy? Whatcha doing?” she chanted, cackling, crying, screaming into his thudding brain. But no amount of struggling or fighting enabled Daryl to reach the rubber band, peel it away, and remove the sock from his hand. Mama Jones was too quick. She struck him repeatedly, bruising the skin of his face, dancing, always just out of reach, away from his searching fingers. And suddenly Daryl knew what had to be done. He’d have to do it the same way he’d done it the first time. Only there wouldn’t be a river nearby. But that was okay. He didn’t need the river now. He went into his closet and pulled out the toolbox. 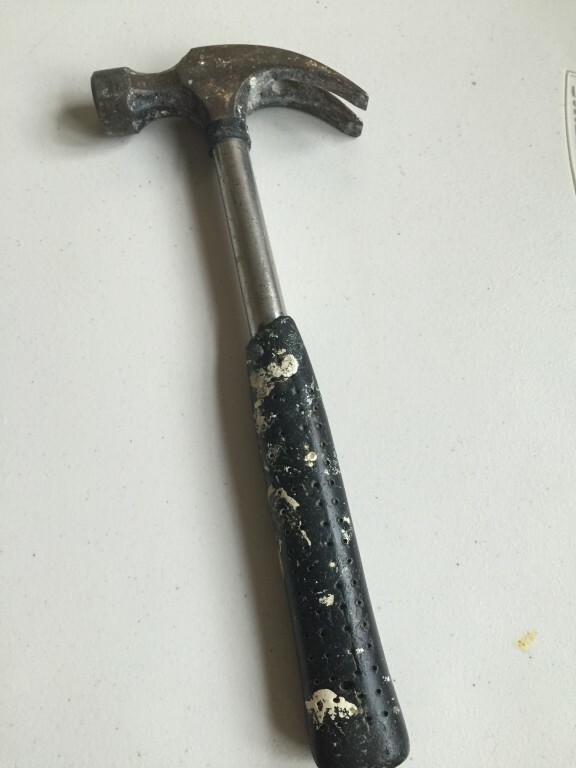 Inside the metal rectangle was a steel hammer with a rubber grip. He pulled it out, and trapped Mama Jones’ beneath his knee. And then he brought the hammer down on her face. Lifting and slamming, lifting and slamming, lifting and slamming, until that high-pitched cackle began to fade, until the sound of “whatcha doing, boy” was more or less a faint echo, something that thrummed against the connective tissue of his brain, but with less and less urgency, until it was nothing more than the ghost of beat inside his head, and still he kept on, lifting and slamming, lifting and slamming, lifting and slamming. Until he was no longer hitting her face but rather the wood that lay beneath. Mark Christopher Lane has no sense of self, which makes bio-writing problematic. However, he does enjoy volatile writing and isn't pleased with his work unless his computer starts smoking. His stories have appeared in Cemetery Moon and Down in the Dirt magazines, he holds an MA in English from Fordham University, and he is busy at work on the proverbial novel. He lives on a hill in New Jersey, far from the creatures below.